Prayer can turn a sleepy, status quo Christian walk into a dynamic experience with the living Christ. It can revive our faith and evangelize our neighbors. It can wake up churches across the Western world to once again worship the living King instead of materialism and ease. The Prayer Factor includes 12 chapters of stories and instruction with study questions that show readers how to move from hindrances and failure to possibilities and victory in prayer. Learn the great truths about prayer and make your life a testimony to a God who hears and answers prayer. 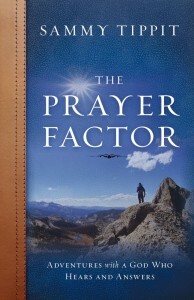 To purchase the book, The Prayer Factor, go HERE! !.